Everyone wants a clean, healthy home for their family to enjoy, no matter where you are. This includes clean, healthy furniture, carpets, rugs, and more. Chem-Dry Excellence strives to provide reliable and affordable professional services by listening to your needs and performing the job as requested. Tanya & Jason are the Independent, Local Owners of Chem-Dry Excellence. So when you call, you speak directly to the owners, not a call centre, to help make your life easier. 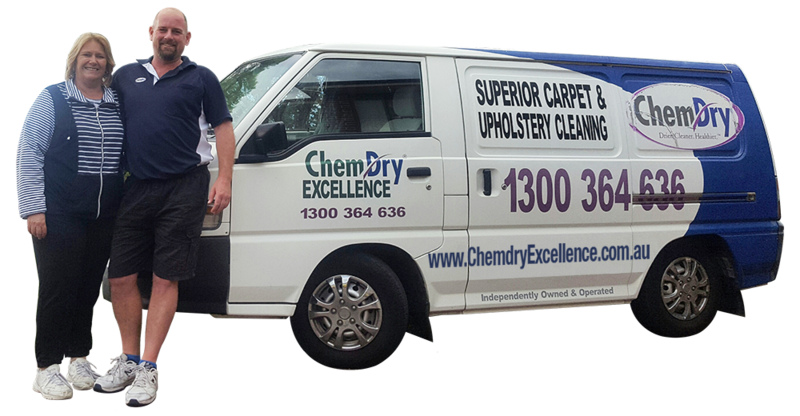 Chem-Dry Excellence has been cleaning carpets and upholstery in the Illawarra for over 28 years, since 1988. Chem-Dry is the largest carpet cleaning franchise in the world and is the world’s leading carpet and upholstery cleaner as ranked by Entrepreneur Magazine for 27 years in a row as the #1 in the category. Chem-Dry also earned an award from Franchise Direct as one of the top 100 global franchises. With more than 3,500 locations worldwide, Chem-Dry is the world’s leading carpet cleaner with international coverage by Independent, locally-owned franchises. Jason and Tanya are fully trained to use all Chem-Dry equipment, methods and products. Chem-Dry is a green-certified company, meaning we strive to provide the safest clean for you and your family as well as for the environment. We cheerfully clean your carpets, upholstery, leather, rugs, mattresses & car interiors in all areas of the Illawarra from Helensburgh down to Dunmore, plus the Southern Highlands using the environmentally friendly Chem-Dry system.